A common thread within the current indie scene is the bid for nostalgia. From Shovel Knight to Axiom Verge, many developers attempt to tap into the feeling that retro games evoke within older gamers. However, few go as far as Tanglewood. Created using actual Sega Genesis development tools, it doesn’t get much more authentic than this game. However, while some titles rely totally on their nostalgia factor, that isn’t the case here. Underneath its retro exterior, Tanglewood manages to be more than just a cheap throwback to what used to be. Unlike many of its spiritual contemporaries, Tanglewood is not a straightforward platformer, but a platformer-puzzle hybrid. The gameplay can really be divided into two categories, straightforward puzzle-solving, and action-oriented puzzle-solving. The former tasks you with finding and utilizing various power-ups to progress through Tanglewood’s diverse locales. This is one of the title’s more unique aspects, as the power-ups you acquire are incredibly varied. Ranging from a simple glide to a Quicksilver-esque time stop, these abilities really shake up the gameplay. The more action-focused sections task you with utilizing your environment to defeat gigantic, ferocious beasts, hell-bent on stopping Nymn in his tracks. You’ll have to drop boulders on their heads, lure them into traps, or simply out-maneuver them to stay alive. Both modes of gameplay work equally well, and are never needlessly complex. Puzzles strike a consistently great balance of length and difficulty, and the solutions almost never feel illogical, with one sole exception involving thunder. On the whole, Tanglewood executes on its puzzle-platforming gameplay brilliantly. In fact, Tanglewood actually gets better and better as the game goes along. There aren’t any points at which the game felt as though it had plateaued, and certainly no times when the quality dipped. 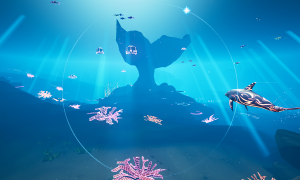 New mechanics and locations were introduced at just the right times to keep things interesting, and I never felt overwhelmed by whatever wrinkles the developer threw at me. The game even gave Nymn an AI-controlled companion during the middle of the game, which was a great addition. However, while the game does build with each successive chapter, the first few are not only comparatively weaker, but just not that compelling on their own merit. In the early chapters of Tanglewood, it felt as though the developers were still getting their feet underneath them. While later areas were marked by interesting visual styles, boss fights, and puzzle motifs, the early game is just rather plain. I wouldn’t consider the opening bad– but it was certainly vapid by comparison. It simply felt like a tutorial that went on too long, with a rather standard forest setting and straightforward puzzles. This section also featured many small enemies which would get in Nymn’s way and turn even the smallest task such as pushing a crate into a nuisance, as Nymn could be killed by them in one hit. Luckily, as with the opening’s other issues, this problem was mostly resolved as the game went along. Tanglewood’s gameplay is mostly great with some hiccups, and that is characteristic of its presentation as well. Graphically, the game has a fantastic retro aesthetic with some great character animations. Nymn’s movements all have a certain charm about them, from the way he bounds across the forest floor, to the way he rolls power-ups and logs across the ground. As mentioned previously, the opening forest is by far the least interesting area visually, but as you move into areas such as the abandoned mines, environments look rather sharp. 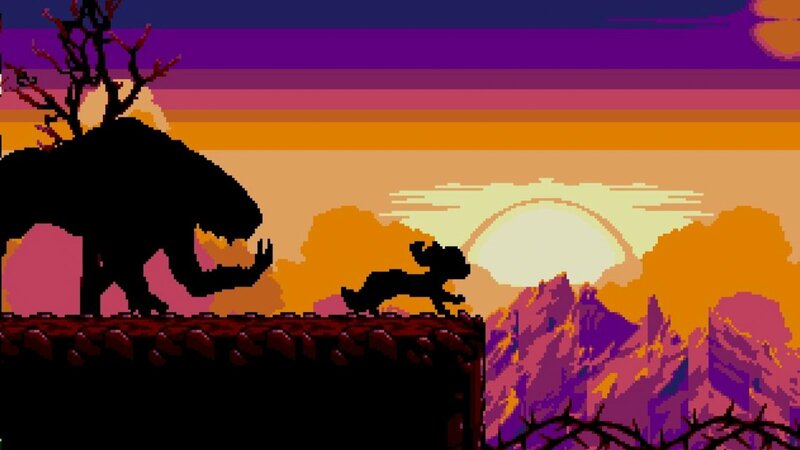 There is even a silhouette chapter very much reminiscent of the modern Donkey Kong Country games, which was a definite standout. A bit more background detailing (perhaps even some pronounced parallax scrolling?) would have been nice though, but that is really just a nitpick. The only major gripe I had with Tanglewood’s presentation was its music, or general lack thereof. Music does kick in at key moments throughout the game, but by and large, there isn’t anything playing in the background. I was disappointed by this, as many fourth generation platformers are marked by iconic music. When you hear Touch Fuzzy Get Dizzy, Green Hill Zone, or Aquatic Ambiance, you know exactly where that music is from. Not having a constant soundtrack in Tanglewood really detracted from the overall experience. On the whole, Tanglewood is a really solid retro-platformer. While it does take a little bit to get going, Tanglewood continuously ramps up, introducing new mechanics and locations at a great pace. This game fits right in with its fourth generation inspirations. From the genuine Sega Genesis development tools to the fully illustrated digital manual that goes over controls and plot, Tanglewood is authentically 90s. While it is short, clocking in at about five hours, the intuitive puzzles and fair checkpoint system in conjunction with that runtime result in a lean, focused puzzle-platformer that all fans of the genre should check out. Developed with genuine Sega Genesis tools, Tanglewood is the epitome of retro throwbacks. Outside of that novelty, Tanglewood succeeds through its intuitive puzzle design, constant drip of new mechanics, and varied locations. While the general lack of music and slow introduction do detract from the game, the sum of its parts is a genuinely great 2D platformer worthy of your time.